Our self serve PPV advertising system allows you to target pop traffic based on country, device, and domain names or keywords. When a domain name or keyword for a website matches your criteria, your ad will be displayed. To create a campaign, first sign up as a CPAlead PPV advertiser. Once your account has been created, you will be ready to add your first PPV campaign. If you already have a CPAlead publisher or advertiser account, you can skip this step. This option will set whether your campaign is inactive or active when it is approved. This will be the name of your campaign for your own reference. This name will not be displayed publicly. This is the URL that will open (pop) on the website when your ad is displayed. You can target any country combination you wish. Target Android, iOS, Mac, and/or Windows traffic. With CPAlead PPV advertising, you can target domain names or keywords. Since many toolbars and plugins display ads based on the site the user is currently browsing, you can target any website or domain. 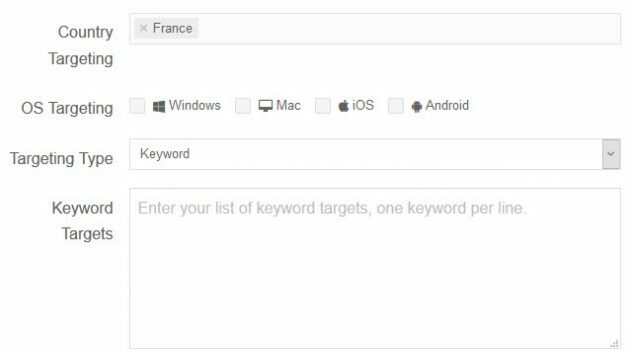 Keywords targets, also known as “paths”, will look for the keywords you entered in the META tags of the website, URL, and and also other page content. If the website matches your keyword criteria, your campaign will be eligible to be displayed on that site. You can also use keyword phrases to increase the scope. As an example for keyword phrases, we will use the phrase “cute dogs”. By using the asterisk (*) as a wild card you can target misspelled keywords and other URL variations. Using domain targeting, you can target subdomains (example.blog.com), root domains (blog.com), or TLDs (.com). Root domain targeting will target the root domain, any subdomains, and the entire full path. As an example, you can target blog.com and also match www.blog.com , example.blog.com, and blog.com/any-blog-post.html. Keep in mind that www. is considered a subdomain. This is the maximum amount you are will to pay per view (pop). The daily budget will limit the amount of money you will spend on your domain name per day. If you have any questions regarding our self serve PPV advertising system or you need help setting up a PPV campaign, please submit a support ticket. To submit a support ticket, please log into your CPAlead advertiser account and click on the Help tab in the left menu.